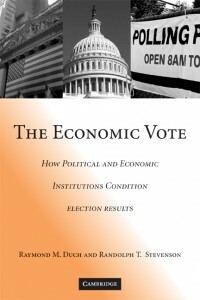 This book proposes a selection model for explaining cross-national variation in economic voting: Rational voters condition the economic vote on whether incumbents are responsible for economic outcomes, because this is the optimal way to identify and elect competent economic managers under conditions of uncertainty. This model explores how political and economic institutions alter the quality of the signal that the previous economy provides about the competence of candidates. The rational economic voter is also attentive to strategic cues regarding the responsibility of parties for economic outcomes and their electoral competitiveness. Theoretical propositions are derived, linking variation in economic and political institutions to variability in economic voting. The authors demonstrate that there is economic voting, and that it varies significantly across political contexts, and then test explanations for this variation derived from their theory. The data consist of 165 election studies conducted in 19 different countries over a 20-year time period. Winner of the 2009 Luebbert Award for Best Book in Comparative Politics Published in 2007-2008!